SRI GNANANANDA TAPOVANAM is located on the northern bank of the river South Pennar, 3 km from Tirukoilur, on the Tirukoilur - Tiruvannamalai highway. Traveling by train, one has to alight at Tirukoilur (Villupuram - Tiruvannamlai Meter-Guage line) and take a taxi / Autorickshaw / 'jutka'(horse cart) to Tapovamam 4 km away. Regular buses ply between Chennai-to-Tirukoilur (via Villuppuram). 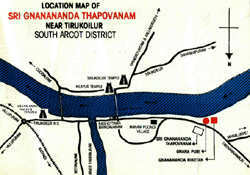 Alight at Thirikoilur Take a town bus/Autorickshaw/Jutka (horse-cart) to Tapovanam. Also, Point-to-Point buses ply between Chennai-to-Villupuram.Take a bus from Villupuram-to-Tirukoilur. Alight at Thirikoilur Take a town bus/Autorickshaw/ Jutka (horse-cart) to Tapovanam. Also, Point-to-Point buses ply between Chennai-to-Tiruvannamalai. Take bus fromTiruvannamalai-to-Tirukoilyur (via Veraiyur), alight at Tapovanam. The following displays a range of Maps starting from India - South India - Tamil Nadu - focusing into Tapovanam.